Homeless U.S. Army veteran Chad Long:"I feel like anybody who served (their country) should have a place to lay their head." On a bitter January day when the wind chill hit 20 below in Grand Rapids, U.S. Army veteran Chad Long headed from a downtown mission to a drop-in center for the homeless a few blocks away. He had been homeless four months. Long, 35, served in Germany from 1999 to 2002. He said he did well enough for himself after the military, earning good money as a construction worker and construction site supervisor. But a drug habit, three knee surgeries and two bulging discs in his back knocked him off his feet. He said he has been clean for months. But he has yet to seek help from the array of programs available to aid veterans. “I just never reached out,” he said. Experts say Long is typical of many homeless veterans, individuals either too proud to seek help or unaware of programs to help them find jobs and housing. “There are all these men out there and they don't know we are there to help,” said Joyce Hopp, homeless veteran outreach specialist for Goodwill Industries of Greater Grand Rapids, a nonprofit that offers job training and support services for people with barriers to employment. Nearly 140,000 veterans stayed in a shelter at some point in 2012, according to the U.S. Department of Housing and Urban Development. Like the general population, veterans are homeless because of factors that include substance abuse, mental health issues or circumstances such as job loss or divorce. But they are nearly twice as likely as the civilian population to become homeless - veterans comprise about 13 percent of the adult homeless population and 7 percent of the general population. 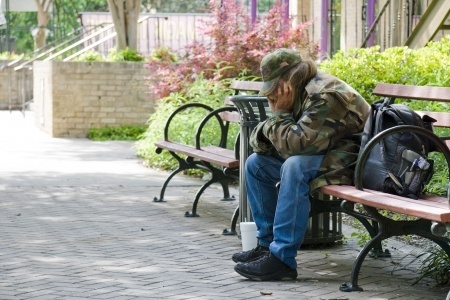 That may be linked to the social isolation of many veterans: Analysis by HUD found that 96 percent of homeless veterans at shelters arrived alone and without family. Experts also say veterans suffering from conditions like post traumatic stress disorder (PTSD) are more likely to “self-medicate” with alcohol or drugs, making it more likely they will become homeless. An estimated 500,000 troops deployed to Iraq or Afghanistan suffer from PTSD, traumatic brain injury or depression. “I can tell you the need is greater than the numbers show,” said Vera Beech, executive director of Grand Rapids-based Community Rebuilders, a nonprofit housing agency. It funnels about $920,000 a year in federal funds into three programs aimed at housing homeless veterans, assisting about 190 veterans and their families each year. Beech noted there has been progress. A federal housing voucher program targeted at chronically homeless veterans helped more than 40,000 veterans nationwide secure housing in 2013. In Grand Rapids, its 110 vouchers are filled. As that program expanded, a single-night count by HUD of homeless veterans in the U.S. fell from nearly 80,000 in 2010 to less than 60,000 in 2013. Still, Beech estimated there might be a hundred homeless veterans in Grand Rapids on a given night. Vietnam War U.S. Army veteran William Yates, 68, said he found himself homeless in January, following surgery and a lengthy recovery at the Veterans Administration hospital in Ann Arbor. During his stay there, he lost the Grand Rapids apartment in which he had been living. “It is very degrading,” said Yates, seated in a day center filled with dozens of homeless men at Mel Trotter Ministries, a Grand Rapids homeless shelter. Yates said he has no immediate family to turn to. His wife died nine years ago, while a daughter lives in Singapore. His two-year tour of Vietnam, including military police duty in 1966 and 1967, seemed a lifetime ago. After three weeks at the shelter, Yates was eager to secure independent housing so he could get his dignity back. “I don't even want anybody to know that I am here,” he said. The Volunteers of America homeless shelter which serves homeless veterans has opened a medical clinic on the grounds of their shelter. The ribbon cutting took place on February 27, 2014. The project cost $900,000 which was jointly funded by Volunteers of America Michigan and Sparrow Health Systems. I don't know if this could be duplicated in GR or if it will solve the problem that is described here. But you may want to contact Patrick Patterson at VOA Michigan for more information. The location of the shelter/medical clinic that I wrote about in the previous comment is in Lansing, MI. In gr rapids Spectrum Health and Goodwill have teamed in program Veterans Explorer. My grandson got a spot after months of fruitless job searching. I heard about it and urged him to look into it. He was so discouraged, it seemed his personality was changing. Now he's finally feeling like there a future. With the big expansion in medical facilities in Grand Rapids over the years something like what Lansing has done should easily be accomplished in Grand Rapids. They have the money there, it is just a matter of is there the will and desire to do it.